EZSportsBetting is a now seemingly defunct sportsbetting portal. They’re not to be confused with EzStreetSports, which is another class of scum altogether. No, EZSportsBetting made a name for themselves all on their own. This article will explain why you should breathe a sign of relief that they’re not in business anymore. 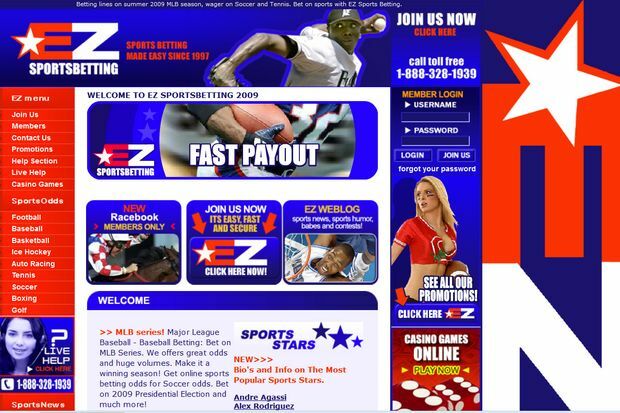 EZSportsBetting.com is one sportsbook, of many, in a network of 100+ (scam) sites run by a group of people in the Montreal area known as the EZ Sports Group. Most of these sites are owned by ex sub-licensees from the World Gaming Titanic Casino and Marketing Partners of Sinsational Entertainment. In fact, the only thing I came across worth mentioning about EZSportsBetting is that at one time in 2004, a player contacted support about requesting a withdrawal. The rep told him that the company did not have the funds to complete withdrawals, and that they were waiting for football season just to keep the lights on. Wow. That makes me feel secure. Let me grab my wallet. What about you? Here are a couple examples of scams pulled by their sister sites. 1. A player requested a payout from SportsWageringOdds. He was told that he needed to continue wagering, even though he already met the wagering requirements. 2. Players from FootballSportsBetsOnline and ProFootballLinesAndOdds reported more than $5,000 in confiscated funds from EZSportsBetting. 3. Here’s a really gross con. Vegas-Sportsbetting (you guessed it, another EZ Sportsbetting site) would offer generous payouts on NFL futures. However, they would void the bets due to “bad lines,” and then not proceed to pay the bets back. One player reported realizing (too late) that they were a scam sportsbook, request a payout of $4,575, only to find out that his account from there on out was blocked. He couldn’t log in, nor did he get paid his winnings. 4. A player won $5,000 on a Giants Super Bowl future bet. He requested a payout, later finding out that he was locked out from his account. Remember this website – EzSportsBetting is a scam operation who’s sole purpose is to steal your money. Avoid them. Theft. Plain and simple. Take the futures scam, for example. They made the lines so generous that players wanted to bet on them. EZSportsBetting took futures bets from players knowing that they would void the bets and keep the funds. In addition to theft, the EZ Sports Group is known for building multiple websites. Some were additional sportsbooks, made with the intention of acquiring new customers. Others were review sites meant to send players to these sportsbooks. Fortunately, for the players that took the time to read reviews, none of these sites started (or ended) with good ratings. All the sportsbook I mentioned above started off at most review sites with an F. So players that took the time to at least read reviews weren’t taken for a ride. For the players that didn’t – shame on you. When will you guys learn? There are more bad books than good, so it’s imperative that you’re not persuaded by flashy banners, slick websites, smooth interfaces and paid reviews. You need to do some legwork, find out who runs these sportsbooks and whether or not they can be trusted. The best way to find legitimate sportsbooks is to ask your friends/peers. The second best way is to visit forums, find the more trustworthy members (that aren’t moderators) and find out where they bet. Taking those steps should lead you to the more reputable books more often than not. Are They Steal Stealing Money Today? This rogue outfit operates under many names that are all part of the EZ Sports Group, built with the intent to acquire customers and steal their money. One example is EZSportsBettingOnline.com, and another is BetOnSportsOnline, which went offline in March, 2008. SBR’s main page for EZSportsBetting – This covers their ratings, scams and other shortcomings. Ez Sports Betting’s Homepage – This is where you can find their website (in case you want to go there to laugh at it).